PLW has announced S-scale double sheathed box cars (O-scale too). The MEC and NYC versions will have printed sides. Gary indicates he will produce them with any car number you request. So what numbers to get? Honestly, I have no idea the date of the paint scheme. 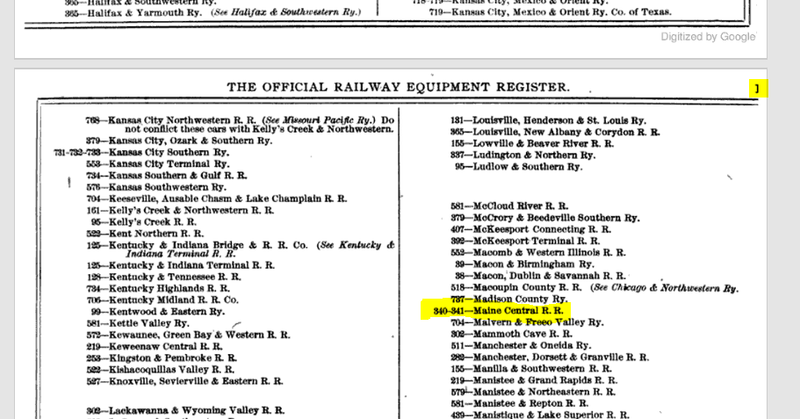 If you’ve never looked at an ORER, you will find a “Index of Railroads” in the first few pages (This was after the powers of attorney pages). It will list each railroad and a page number. 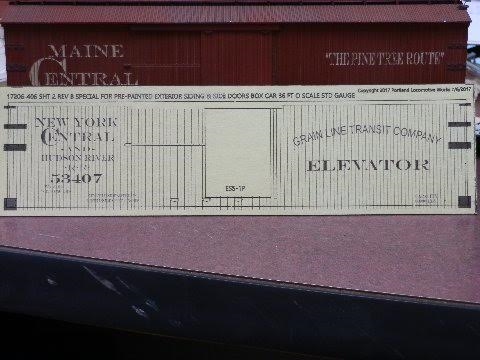 One can than use that page number to find the page for the railroad. The page number does not correspond to the PDF’s digital page number. So it can take a bit of scrolling to find the proper page. The Maine Central pages seem to be 340 to 341. So I scrolled down to those pages. It’s hard to read the page numbers in the book as they are cut off in the scan. 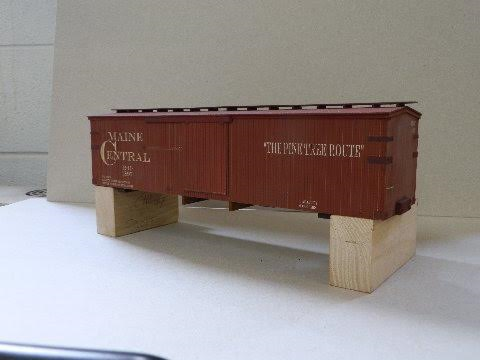 According to PLW, the S-scale, box cars are roughly 6 5/8″ long, or roughly 35′. The number on the pilot model is 1897, but others are in the 8000 series. In the 1912 ORER, the 1800’s are used for coal hoppers, so that number does not seem appropriate for my time frame. Possibly it is correct for an earlier time frame. 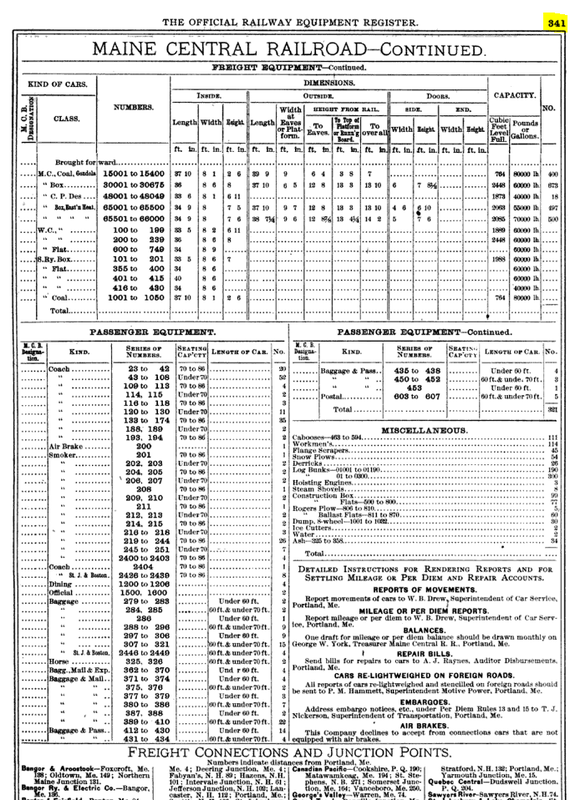 The 1912 ORER lists 8001-10400 as 36′ box cars (actually 36′ 9″ outside length and note that 9818 had an end door), so I’ll go with 8000 numbers. The length is off by a bit more than one foot, and I do not know if the lettering is accurate for 1912, but who cares, close enough. So I’m picking 8015 and 8301 for my two cars. Hopefully no one else picks my numbers, that way I can pick up an additional car and not have a conflict. I plan to rotate standard gauge cars on and off the layout in Farmington. My hope is to have the waybills for the SR&RL cars have a specific standard gauge car to deliver to. 2-3 SR&RL cars will be billed to a standard gauge car. Think of each standard gauge car as a unique industry in Farmington and what’s even better, the industries in Farmington will change location between or even during an operating session. The Farmington switcher (SR&RL #7) will have to deliver to make multiple spots at a standard gauge car to fill it up (or unload). Then the standard gauge car will be moved off layout. This should make the Farmington switcher a full filling job to work. In addition to the two MEC cars and the NYC car, I plan to order two undecorated cars. 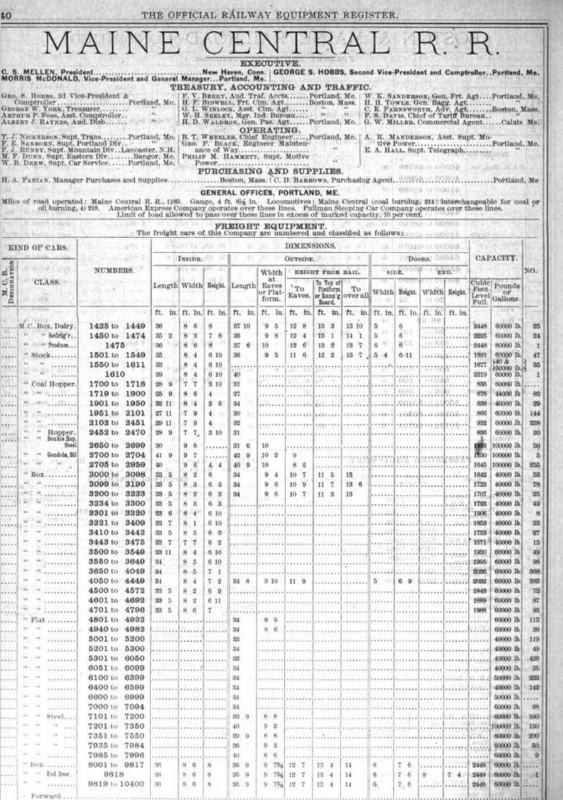 Looking through the SR&RL books, it seems that B&M, Erie, CV, and other boxcars game to Farmington. Like most PLW offerings, I expect the standard gauge cars to have limited availability. Reruns would depend on demand. John Rogers may have been one of the most controversial, yet successful On2 SR&RL models ever. He stormed on the scene with radical ideas and ambitions, got a successful operating and mostly sceniced representation of the SR&RL, then exited the scene almost as quickly as he came in. Some may call him brash, but I found him endearing, generous and passionate. Through him I got invited to a great OP’s weekend where I got to operate on his On2 SR&RL, Tony Koester’s HO NKP, and Craig Bisgeier’s HO Housatonic Railroad. It was a TT&TO enthusiasts dream operating weekend. John and I had met at the 2011 NNGC in Hickory, NC. At that time John was storming along on his On2 SR&RL. We had many conversations about the SR&RL, operations, TT&TO, On2, and Sn2. John was as enthusiastic for me as anyone else. John has since moved on to bigger things. He is doing 2-foot outside and inside it seems. He has more youtube vidoes posted for his current adventures, checkout his youtube channel. I was skimming through Al Churella’s website looking for inspiration and found a link to this video on youtube. I love Al’s modeling, take a look for yourself. Madrid is a site I plan to include on the Sn2 SR&RL. Clearly I have lots of dreams, some will come to fruition, but none of them will be what I want if I keep shifting my energies and resources all around. So, I proclaim, I need to pick a home layout and jump in with two feet! So what should I jump into? DT&I is out – Actually 3-4 weeks ago, the HO DT&I was hot and heavy. I thought I could build Ford park at one end of my basement on top of (or under) Kingfield. I could probably make something fit…but it was not going to be special and the 20+ foot long trains would have looked funny in my railroad room (24×30′). The DTI regularly ran 3-4 diesels on the front end of trains, it simply would have looked bad pulling anything less than 20-25 cars…Anyway…I may have some 1976 freight cars on ebay soon. S-scale – I really like the size of S-scale standard gauge. I’ve considered the C&O of Indiana or the PRR in Cincy or B&O or other. S-scale is still in the running, but it seems doubtful right now. How to meet my locomotive needs? The current 5 SR&RL locos will not meet my needs and scratch building is not in the near future….Answer: How about a compromise of Blacksone K-27’s? Yea, not cheap, but they run great out of the box, have sound, and are steam. Seems better than running diesels, given my 1912-1914 era. I could practice building steam by re-detailing them. These engines could put in the miles running the railroad for show purposes so as not to wear off the nickel platting on an Sn2 brass Forney. Can the locos pull a 2% grade? I think the answer is yes and I really think the K’s could pull more than enough…A future 2-6-0 or 2-6-2 should be close to a K, might be a bit less as those K’s are quite heavy. Now the Jeff B has gotten us bolster for the Tichy Trucks I think Tichy and/or Smokey Mountain should roll sufficiently well. Both should be simple enough to assemble. What about spiders for all those turntables? I could have 5-8 turntables…. So, step back…I’m about to take a running leap and jump all in! My link to Al Churella’s layout had been broken. It is now fixed.